The Narendra Modi government claims that India’s foodgrain output will hit a record 271.98 million tonnes (mt) in 2016-17 — up from last year’s 251.57 mt — with production of rice, wheat, maize, pulses and even oilseeds estimated at all-time highs. Yet, fertiliser sales — considered a proxy for farm sector growth — are down. The accompanying table shows this to be the case with urea, di-ammonium phosphate (DAP) and complexes containing varying proportion of nitrogen, phosphorus, potassium and sulphur. 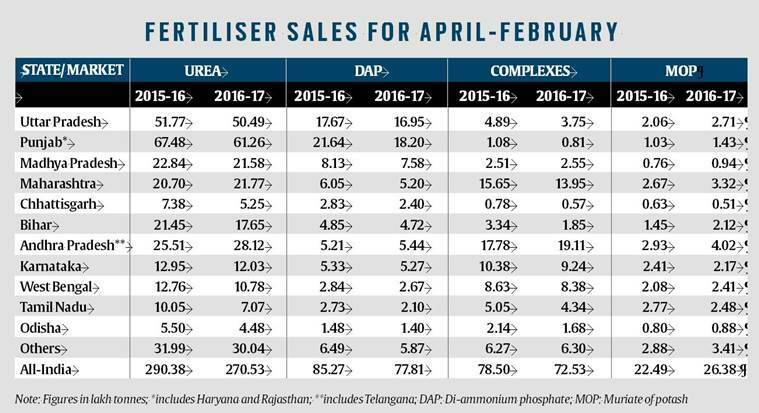 The only nutrient to have registered higher offtake during April-February over the corresponding 11 months of 2015-16 is muriate of potash (MOP). Not many are able to offer a convincing explanation for this seeming puzzle. Lower fertiliser sales in a year of agricultural rebound after back-to-back droughts, is a phenomenon never observed before. One reason being given is that sales by fertiliser firms may not be always reflective of actual consumption at the farm. There could be years when firms book higher sales, but the resultant stocks with dealers aren’t lifted at the farmers’ end. Thus, it is possible that companies last year made available large quantities of fertiliser material to wholesalers/retailers, which farmers, however, did not buy and apply in fields owing to drought conditions. “Sales have dipped this year, partly because there was lot of inventory in the system at the start of the kharif system. A significant part of farmers’ consumption requirement would have been met from these pipeline stocks with the trade. So, while our sales are lower, consumption by farmers might have still risen,” notes Suresh Krishnan, managing director of Zuari Global Ltd, which controls three fertiliser concerns: Zuari Agro Chemicals, Paradeep Phosphates and Mangalore Chemicals & Fertilisers. Krishnan, nevertheless, concedes that “we cannot, as of now, establish whether or how much consumption has gone up”. Moreover, even the purported mismatch between sale and consumption cannot account for the extent of drop in the former. The nearly two-mt drop in urea sales is particularly striking. The agriculture ministry’s data on annual urea consumption show this to have hovered between 30 mt and 30.6 mt from 2012-13 to 2015-16. Assuming no major discrepancy between sales and consumption, the latter may end up at around 28 mt for this fiscal, a level last seen in 2010-11. G Ravi Prasad, president (corporate affairs and strategic projects) at Coromandel International Ltd, the market leader in complexes and single super phosphate, attributes the decline in sales of urea to the Centre’s decision to make 100 per cent neem-coating mandatory for both domestically manufactured and imported material. Coating of urea with neem oil — at 350 ppm or 400 ml for every tonne — has stopped the illegal diversion of the country’s most widely-consumed fertiliser for non-agricultural applications. Being heavily subsidised and, hence, cheap, urea is used as a binder by plywood/particle board makers and for sizing (smoothening) of textiles. It is also a common adulterant in milk. But, Prasad reckons illegal diversion of urea for non-farm purposes to be not more than 0.5 mt. He links the balance 1.5-mt reduction in urea consumption this year to the other big “magic” that neem oil coating has done. When urea is applied to the soil, it is first hydrolysed or broken by water into ammonium ions (NH4+), followed by oxidation to nitrite (NO2-) and, then, nitrate (NO3-) forms. This nitrification process is what makes the nitrogen, which is 46 per cent in urea, available to the crops. In normal urea, however, the conversion to nitrate happens very rapidly. As a result, up to two-thirds of the nitrogen is lost either through underground percolation (‘leaching’) of nitrates or ‘volatilisation’ (escaping into atmosphere). Neem oil basically acts as a ‘nitrification inhibitor’ when coated on urea. By slowing down urea hydrolysis and nitrification, it allows a more gradual release of nitrogen, which can be used by the plant. “Neem-coating increases nitrogen use efficiency. Also, since the urea action is prolonged, the plants stay greener for a longer time. Farmers apply urea when they notice the leaves turning yellowish. But if the crop here is retaining greenness for an extended period, they would reduce the frequency of application. Instead of three bags for an acre of paddy or wheat, they might be using only two now”, Prasad points out. But it’s not just urea. Reduced urea usage would have dragged down consumption of other fertilisers, too. Farmers usually give a first basal dose of DAP or NPKS complexes such as 28:28:0:0 and 20:20:0:13 independently of urea. However, subsequent doses are given along with urea, as it enables them to save on labour. “A worker hired for a day costs the same whether he/she applies only urea or urea plus DAP. If the frequency of urea application comes down, so will that of other fertilisers. It could translate into farmers using half-a-bag less DAP or complexes per acre than before,” adds Prasad, seeking to explain why sales of DAP and complexes have also fallen, even if not as much as for urea. The “magic” from neem-coating notwithstanding, there are concerns over sharp practices being resorted to here also. Neem oil used to coat urea is supposed to contain 150 ppm of azadirachtin. This active ingredient in neem oil has a benzene ring structure somewhat like chlorobenzene that is present in transformer or cutting oil. “The analytical method for finding out whether urea is neem-coated is to detect the benzene equivalent in the oil. But it also allows for coating urea with cutting oil, which costs Rs 10-20 per litre as against Rs 70 or so for neem oil,” says an industry source. Fertiliser companies have been permitted to charge 5 per cent extra for neem-coated urea, over the existing maximum retail price of Rs 5,360 per tonne. “The 5 per cent comes to Rs 270, which is more than the Rs 100-125 per tonne cost of neem-coating. There are some unscrupulous players, who are seeking to reduce costs by replacing neem with cutting oil,” as per the source.